I’ve walked past Frank Street Bakery in Birmingham dozens of times, hardly giving it a thought until a fellow Detroit foodie who goes by the name “Chow Down Detroit,” started posting mouth-watering pictures of food from Frank Street on Instagram. I assumed it was just an old clothing store turned into a bakery, but I was completely blown away when I walked in to find a cozy seating area and a nice, clean kitchen space. At Frank Street Bakery, you can satisfy your sweet tooth and coffee addiction, but you can also try a breakfast croissant, salads, subs, paninis, wraps, soups, or smoothies. And while most bakeries are known for their…well…baked goods, Frank Street is known for their hot-pressed Cuban sandwich! Who knew that Detroit could do a Cuban? Today, however, I was really craving the trusty soup and salad combo. I had heard solid reviews of their chili, so I went with a cup of the white chicken chili. I was warned by an employee that it was “really spicy,” which made it that much more intriguing. He proceeded to tempt me with spicy potato chips and peppers, but I figured that the chili would be enough spice for one meal. 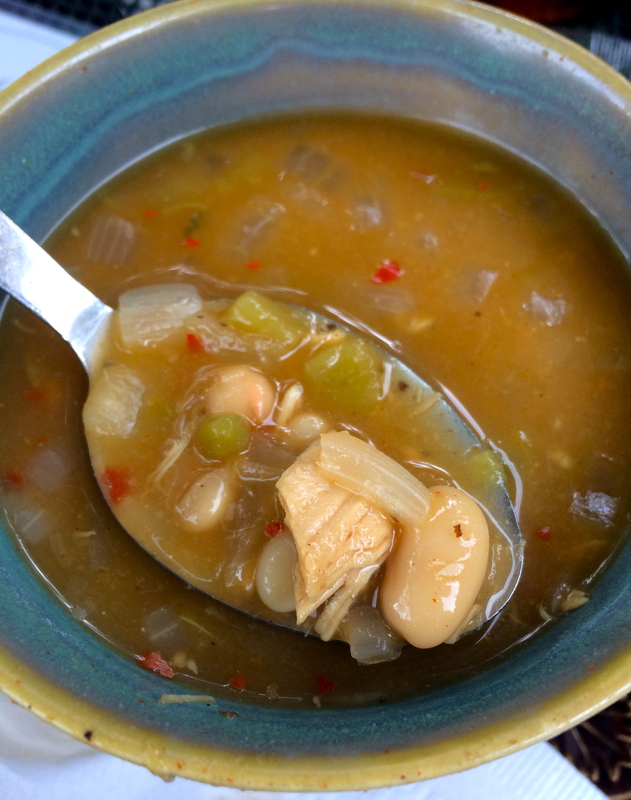 It turned out to be broth-based, but I liked that it wasn’t extremely chunky and sooo filling. And the spice level was actually pretty hot. I didn’t fully believe the warning, so beware if you’re sensitive. 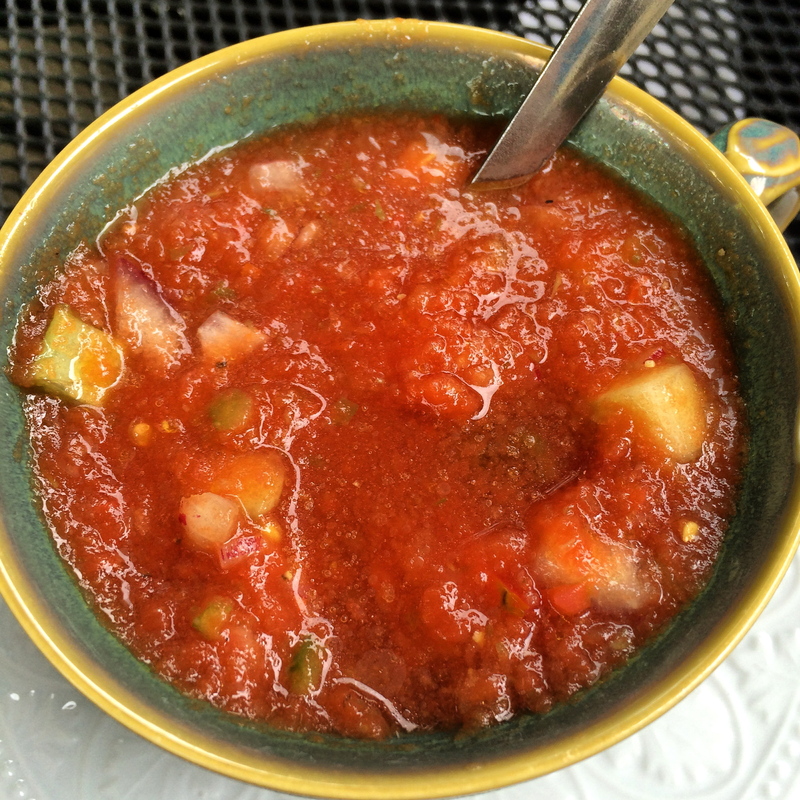 If you’re craving something summery and light, order a cup of the gazpacho instead. It came out in a painted mug, and was pureed nicely, with chunks of tomatoes and cucumbers. The seasoning was perfect! A+ on this soup. For my main course, I ordered the Greek Salad. I know, a little boring, but for $5.99, I couldn’t pass it up. 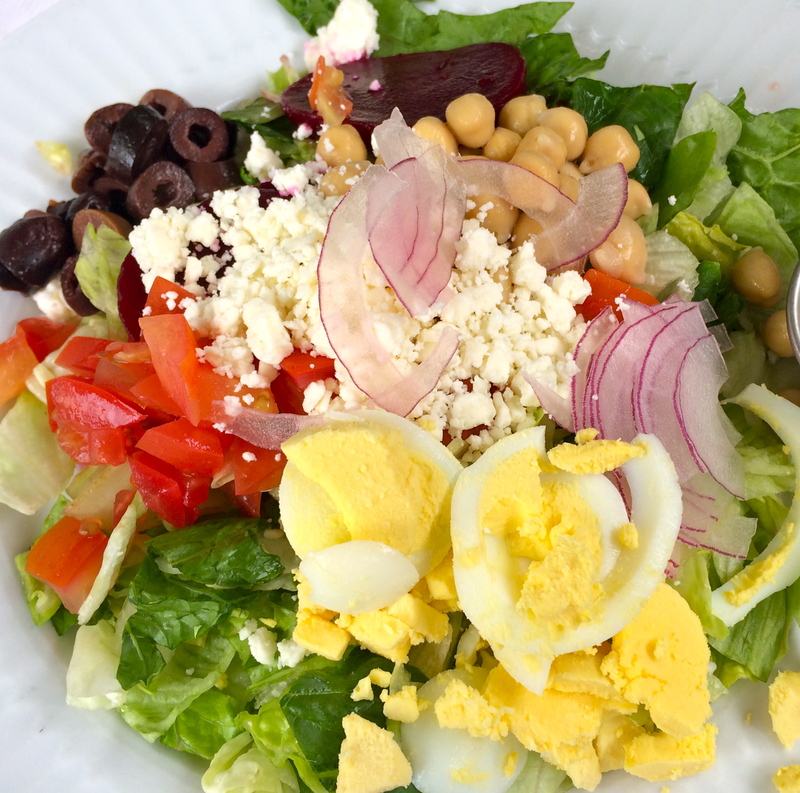 I loved that it came chopped, with hardboiled egg in addition to the typical ingredients (beets, feta, olives, chick peas, lettuce, tomato, and onion). It was the perfect salad, and everything seemed very fresh (Leo’s, you could learn a thing or two from Frank Street’s Greek). And Frank’s is more than willing to add or subtract salad or sandwich items, or even let you build your own! With amazing prices, friendly staff, and outdoor seating, this place is a hidden gem in downtown Birmingham. The next time I am near Frank Street, I may just walk right in! Phone #: (248) 792-5192. They offer call-ahead ordering, carryout, and catering! Hours: M.-F. 9 a.m. – 5 p.m., Sat. 9 a.m. – 3 p.m.
Chat with Coneys and Kale: What is your favorite lunch food(s)? Leave a comment or picture here, Twitter, Instagram, or Facebook !